Sedona real estate is often located close to some of the finest art you'll find. Whether it's musical, visual or performing, the city is often home to a multitude of locations and festivals that include music, film and even folk art. So when you purchase a home in Sedona, you'll soon discover you've purchased a home in one of the most creative places in Arizona. If you buy any Sedona home for sale then chances are you'll always be near some type of art gallery, or musical venue. The arts, including folk art (like Navajo domestic arts), can be found in abundance here. If you love the theater, be sure to check out the Sedona Performing Arts Center. 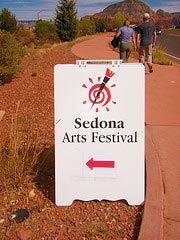 If you love the visual arts, there are lots of galleries to enjoy as well as the Sedona Gallery Association. They offer ‘gallery-hopping’ tours to several locations once a month. People who enjoy festivals will also love Sedona for its wide variety of events that celebrate film, like the famous Sedona Film Festival that happens every February, or the multiple music and painting venues including the Sedona Jazz Festival or the Sedona Plein Air Art Festival. So, if you're an artist or performer, or if you love watching entertainers at their craft, purchasing a home in Sedona might be perfect for you.